1. RRG could have been turned into a lake, but was saved by a protest hike. Back in the 1960’s, there was a dam proposed in the area for the purpose of flood control. A group of concerned citizens with the help of the Sierra Club arranged the Dam Protest Hike of 1967. On November 18th, groups were led on a hike of the Red to showcase its unique beauty. 2. RRG is registered as a National Natural Landmark. The fight to keep the gorge from being drowned led to its inclusion as a National Natural Landmark, as well as being included on the National Register of Historic Places. It is also a National Archeological District and the Red River itself, as of 1993, has been declared a National Wild and Scenic River. 3. RRG is home to one of the earliest examples of agriculture being utilized by prehistoric peoples. With unique rock shelters, RRG is the home of approximately 664 prehistoric and historic archeological sites, some dating back 12,000 years. Examples of early seed gathering and storage have been found in the gorge, as well as everyday items such as baskets and moccasins. For this reason, RRG is a National Archeological District. 4. RRG is one of many supposed sites of John Swift’s Lost Silver Mine. You may be familiar with the campground bearing his name and the beautiful trail named Swift Camp Creek, but did you know that John Swift was a real man and, according to his journals, he found and consequently buried a fortune in silver. The directions he left are vague (with markers like “by a creek”) and many other sites claim his silver for themselves. 5. RRG is home to an endangered plant that is unique to the rock shelters of the area. That’s right. Real treasure does exist. Namely, the White-haired Golden Rod (Solidago Albopilosa). This flower only grows in one place and that place just happens to be right at RRG. Unfortunately, the number of plants is declining due to human trampling. Take a look at it, memorize it’s shape and color, and please, keep your big feet off of them! 6. RRG is also home to three endangered animals. The Indiana Bat (Myotis sodalis) , the Virginia Big-eared Bat (Corynorhinus townsendii virginianus), and the Red Cockaded Woodpecker (Leuconotopicus borealis) all make their home in and around RRG and are all on the endangered species list. Unfortunately, the bat population is being decimated by White-nose Syndrome, a fungal infection that can infect entire colonies of bats. However, you can do your part by not disturbing the caves in which the bats make their home, especially in the winter. If a bat is awakened from its hibernation, it may lose enough body fat in being active to not survive the winter. Be mindful! 7. Kentucky has its very own long trail, the Sheltowee Trace, that goes right through the heart of RRG. You may have seen the blazes on the trees of a white turtle and wondered what that was all about. That, my friend, is the path of the Sheltowee Trace, a ~300 mile long trail leading from Morehead, KY in the north all the way down to Big South Fork on the KY-TN border. A hike on the trail will take you through Cave Run, Cumberland Falls and, of course, RRG. Don’t have time to hike all 300 miles at once? There’s a group that meets to do it 30 miles at a time over the course of a year. 8. The Clifty Catman is stalking you. The Clifty Wilderness encompasses the eastern and northeastern sections of the gorge and is home, according to legend, of the Clifty Catman. This creature is the size of a horse, has the skeletal structure of a large cat, the skin of a human and a beautiful baritone singing voice with which he leads hikers astray. Be wary! If you catch a glimpse of the Clifty Catman and live to tell the tale, please comment and let me know what sort of warding talisman you had in your possession. 9. The Red River Gorge Climbers Coalition is buying property to preserve cliff line. Thus far, two areas have been purchased: the Pendergrass-Murray Recreational Preserve (PMRP), 750 acres, and The Miller Fork Recreational Preserve (MFRP), 309 acres. They also host trail building days during the summer which are a lot of fun with a great group of people. Get involved here! 10. The Red River Gorge Trail Crew hosts trail building/clean ups every second Saturday of every month. A great way to give back to the area that has brought so much joy, RRGCC helps preserve and maintain the gorge so that it will be beautiful for generations to come. They work with the U.S. Forest Service and information concerning volunteering can be found here! 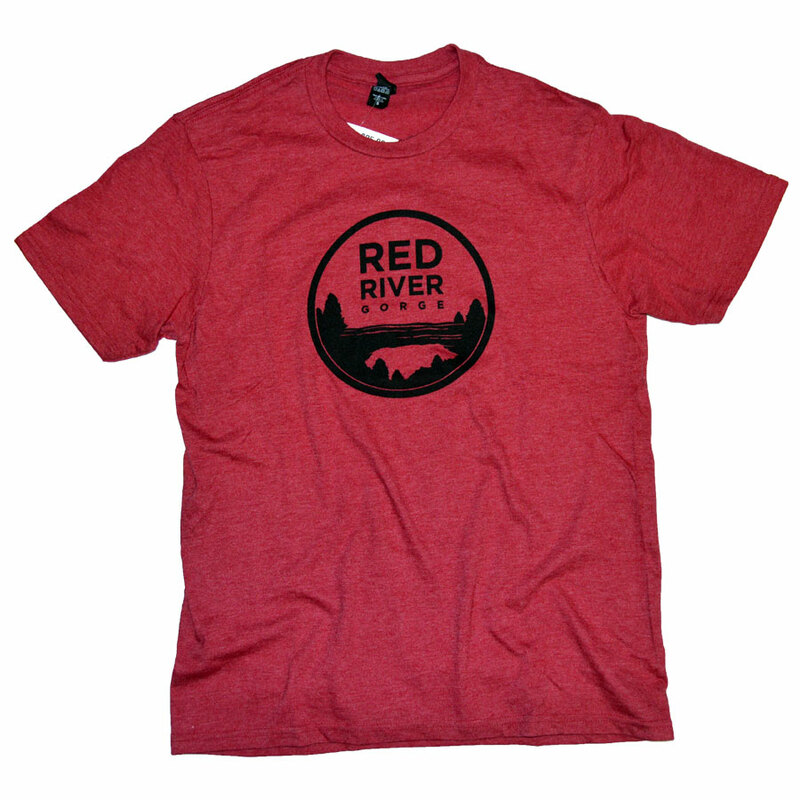 Check out our selection of custom RRG tees and hats!